You are here: Home / Latest News / Join us at our Fundraising Dinner! Join us at our Fundraising Dinner! 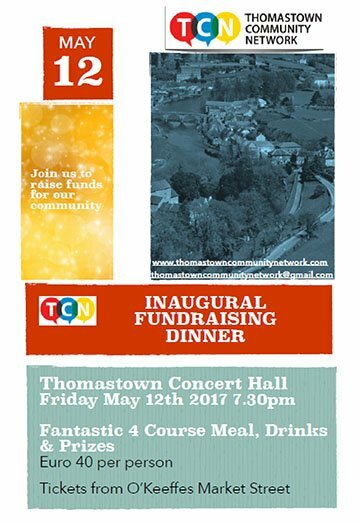 All in the community are invited to join our at the inaugural Thomastown Community Network Fundraising Dinner, to be held in the Thomastown 1910 Concert Hall on Friday May 12th, beginning at 7.30 p.m. There will be pre-dinner drinks, a four-course meal, and a raffle with some great prizes on offer. All funds raised will be used for the benefit of the entire community. Tickets cost €40 each and are available from O’Keefe’s in Market Street. Tables of 10 are also available for group bookings.